With a new President appointed, new RFID ticketing, new snow cats and new terrain this season, Revelstoke Mountain Resort is upping its game. Canada’s newest mountain playground today revealed even more improvements coming for 2019-20, including new beginner chair and surface lift. The high elevation beginner zone will sit between The Ripper and Revelation Gondola, its quad chair called Cupcake. “This lift will provide an ideal training ground for beginner skiers and riders, and also provides direct access to the Ripper, alleviating some of the pressure on the Stoke Chair,” noted Vice President of Operations Peter Nielsen. The lift will take just over three minutes to ride and move 1,800 skiers per hour. 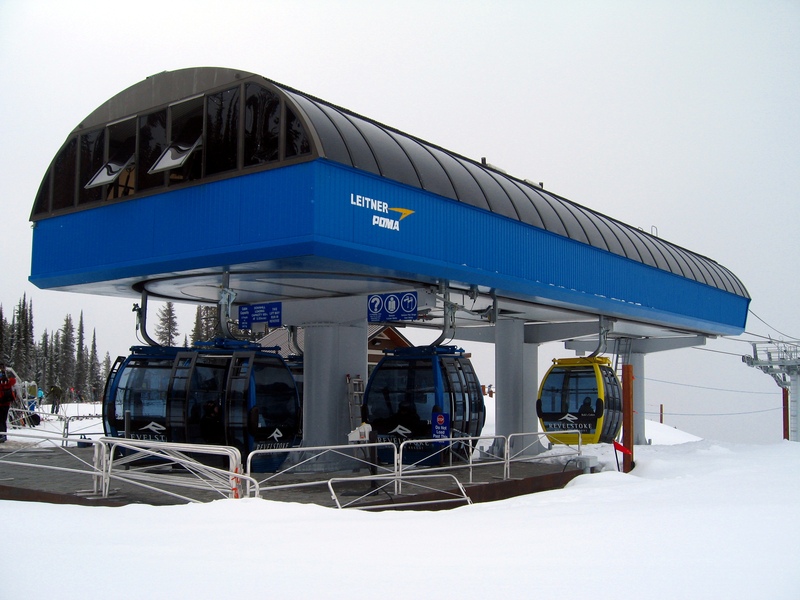 Leitner-Poma Canada constructed all four of Revelstoke’s current lifts, though no manufacturer was specified for the new one. The resort has also placed a third order for 22 gondola cabins, bringing the second stage of Revelation to its design capacity of 2,800 guests each hour in 2019. The new Cupcake lift may follow alignment 25 on the Revelstoke master plan, though things may have changed somewhat. Orange lift 14 is The Ripper, built in 2008. Located on the Trans-Canada “Powder” Highway between Kicking Horse and Sun Peaks, Revelstoke is one of three Ikon Pass destinations in British Columbia. The new lift will be the first built since Revelstoke ran out of cash in late 2008, less than a year after opening. By the time Leitner-Poma finished the company’s second batch of lifts, the global financial crisis doomed the Denver-based developer of Revelstoke Mountain Resort, which sold it to Northland Properties. It took a decade, but many of BC’s interior resorts are back in the green and adding lifts again. “We are well poised for a second lift and future on-mountain infrastructure development,” says Revelstoke. Mt. Hood Meadows, Skytrac and Timberline Helicopters fly Buttercup towers in just 45 minutes. Vail Resorts schedules annual meeting for Wednesday, December 6th, where multiple new lift projects are likely to be revealed. Aspen Skiing Company, the City of Aspen, private landowners and the public collaborate towards building a long-sought detachable Lift 1. Latest LST detach update: chairs are back at the factory being reworked and the Envers lift is expected to be up and running around Christmas. Revelstoke adds 24 new gondola cabins, Crystal Mountain gets five more. Navajo Nation leadership soundly rejects Grand Canyon Escalade gondola in 16-2 vote. SkiCo and the Aspen Valley Ski & Snowboard Club plan to build a platter surface lift on the skier’s right side of Golden Horn at Aspen Highlands next summer. There’s an unconfirmed rumor that the Cyclone at Sunrise Park, AZ won’t operate this winter. The 1983 Yan is North America’s longest triple chair at 7,982′ with 32 towers and 352 chairs. I’ve reached out to Sunrise for comment and will update if I hear anything. Montana Snowbowl’s TV Mountain expansion won’t open this season. After building three new lifts in a row, the Hermitage Club finds itself in a cash flow crunch. Revelstoke homeowners aren’t happy lift development has stalled for almost ten years now. The resort’s response identifies master plan lifts 1 and 11 as the highest priorities but notes construction of them is subject to market demand. In an interview, new Crystal Mountain owner John Kircher says he wants to build a second gondola to Campbell Basin. NY State Fair gondola continues to be targeted as an example of government waste. 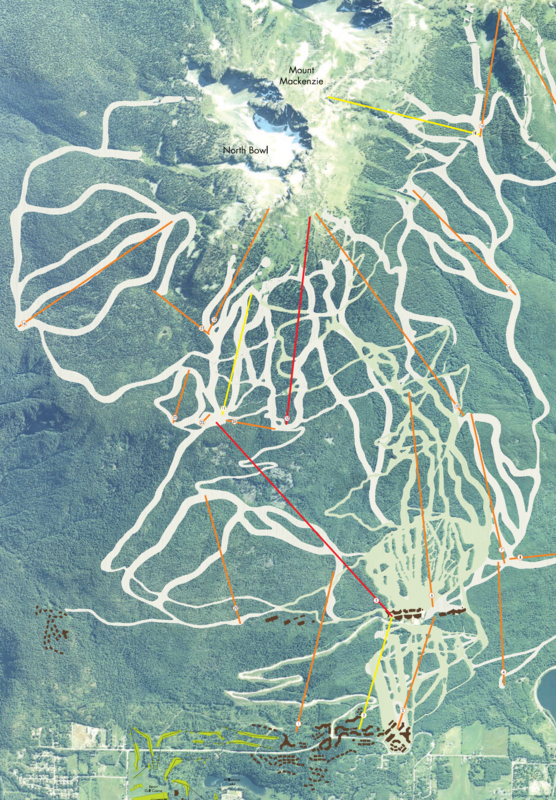 Whaleback’s T-Bar project is a go. The lift came from Plattekill, NY and will be installed by SkyTrans. New Gatlinburg Sky Lift looks to be almost finished. Poma reaches agreement to build new gondolas in Vietnam with the first next-generation Sigma Diamond EVO cabins introduced yesterday at Interalpin. The new cabins offer more natural light and feature doors that slide rather than opening out. Move over D-Line: the new Leitner Station is here. LST gets another detachable contract. Leitner launches urban gondola in Berlin. Skier visits at Vail Resorts were down 2.8 percent this season but lift ticket revenue increased 7.4 percent. Mi Teleférico opens $1.5 million Operations Control Center with 22 people monitoring 1,300 surveillance cameras on 66 screens and lightning detection system for four gondola lines. Purgatory will add a mid-station to its Needles triple this summer. MND Group’s LST Ropeways subsidiary invested $4.3 million and hired 25 people to develop detachable product that is now available worldwide. Cleveland Planning Commission considers nine-station gondola network. Arizona Republic takes a deep dive into Grand Canyon Escalade cultural and natural resource issues. Big investments are likely coming to Steamboat, Winter Park and the rest of the resorts KSL and Aspen acquired this week. Leitner has a new iPhone-like control system called LeitControl. Are there too many urban gondola ideas? Revelstoke will add 24 cabins to the Revelation Gondola this summer along with 21 chairs to The Stoke to address sometimes epic lift lines. Mechanics in New Zealand work to repair the fire-damaged lift at Christchurch Adventure Park. New York State Fair Gondola funding slammed by politicians and citizens alike. 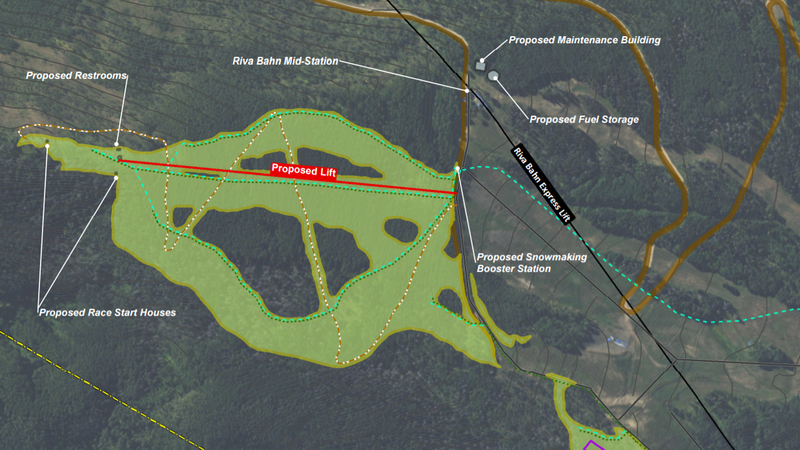 Vail Mountain proposes 1,870 foot fixed-grip lift above the Riva Bahn mid-station on Golden Peak. Vertical transport feet per hour (VTFH) is the best way to measure how lifts move people up mountains. VTFH combines hourly capacity and vertical rise into one number, usually measured in millions. Ski Area Management uses this metric each fall when they look at how good of a year it was for the lift-building business. The second stage of Revelstoke’s Revelation Gondola has a VTFH of over 8 million, the highest in North America. For a lift to score big it has to have a high hourly capacity (think lots of carriers, high speed) and large vertical rise (think big slope length with many towers.) The Jackson Hole tram has a huge vertical (over 4,000′) but very low capacity so its VTFH is only 2,654,600 – not even in the top 400. The Peak 2 Peak Gondola has a huge capacity but only rises 119 feet for a dismal VTFH of 243,950. There are 49 lifts in the US and Canada that move enough people high enough to achieve a VTFH over five million. Below are the top ten.